Ventilating the Attic and the Crawl Spaces has long been the traditional and code required method of home design and building. However, ventilation of these spaces was required because standard materials and building design practices were not capable of addressing radiant heat transfer, condensation, and the results of "stack-effect issues." In order to address heat transfer form weather issues, utilities, and the formation of moisture due to condensation and air infiltration, the only option was to ventilate the attics and crawl spaces. The major problem with ventilating these spaces is that the air brings moisture, pollution and other adverse problems and challenges with it. Furthermore, the vents to allow it in create voids in the building for insects and rodents to enter, and all our nice conditioned air that escapes, or is pulled from the living spaces to exit. 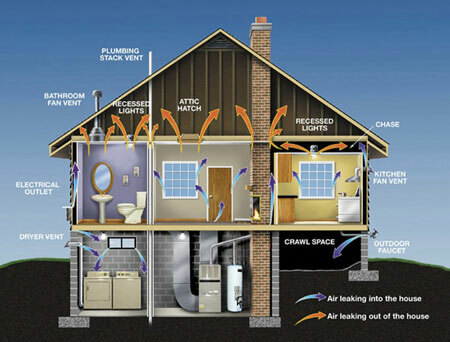 If our heating/cooling utilities and ducts are located in the attic and/or crawl spaces (most usually are) then their radiant contact with the ducts will cause them to loose up to 10% or more of the hot or cold air flowing through them due to radiant transfer. Worse yet, moisture and mold can also form within the ducts during certain temperature conditions, causing adverse health affects to the building occupants or your family. Another major reason that traditional methods call for attic ventilation is that during the hot summer months, heat from the sun builds on the roof and radiates into the attic space. In fact, it can build to upwards of 130 to 150 degrees or more. (see our section on Urban Heat Islands). This extreme heat radiates into the attic and the living space causing condensation and the potential for mold. Our air conditioning systems also need to work harder and consume more energy with all this heat directly above our heads. The extreme heat also makes it very uncomfortable to enter these spaces. This section will highlight further advantages of spray polyurethane foam insulation, methods of construction and its specific use in the Building Envelope.